When I was studying in the UK back in 1999 ­– paying triple the fee of other students sitting on the benches next to me because I was a non-EU student – I was offered a job with CNN London. I cannot remember the job description, although I seem to remember vaguely that it was not to replace Christiane Amanpour, but more likely to make tea for her. It was something junior-of-the-most-juniorest-assistant in the CNN newsroom, probably with a non-desk in the tea cupboard. But! It was CNN! Twirl! Joy! Eureka! However, there was one little caveat. One tiny, small print condition that I could not ignore: I needed to be an EU citizen. Therein followed a series of unfortunate swearwords. I was not eligible, the job went to someone else, and the pain of that wound is still pulsing. That was a defining moment for me. April 5, 1999, sitting on a bench in Hampstead Heath and reading the letter of acceptance and its conditions; scrunching it with cold, sweaty, angry hands. It was the moment when I fully embraced the European Union project – I so much wanted to be able to work outside of our tiny island. Thankfully (and luckily that at the time that people ignored Joseph Muscat, there was no Facebook and no Cambridge Analytica), four years later Malta voted to become a member. And five years later, as Malta was signing the accession treaty, I was packing my bags to work in Luxembourg. When, later, my daughter was born I was delighted that she would have none of our 316 square kilometre constrictions – the whole continent was hers for exploring. And (in a moment of pure parental transference) I thought, hey, she could even work for CNN! That definitely cannot happen now, because of this tragic unfolding drama called Brexit. However, there’s no stopping her from going to Ireland, Spain, France, Greece or wherever the wind takes her. This time round, it is tragic for the British youth. The other day I was talking to a 20-something young Briton who’s definitely crush­ed. “I am working here in Malta now, and I want to be able to go and travel and work my way round Europe. We cannot just do that now, we have to renegotiate everything with every country and keep our fingers crossed,” he said. By and large, Brexit has become a generational issue. I was in London last September and went to the proms in the park. Young people were all kitted in EU flags, the older ones dressed from head to toe in Rule Britannia Union Jacks. Of course, there’s more to the EU than job mobility. And there are pros and cons of being a member. However, over the last 20 years, with a lot of help from the media, some of the cons have been amplified or downright invented, and for many British, Europe had become nasty whipmaster to be blamed for all the little (or huge) resentments. The problem, I would say, lies fairly and squarely in Brussels, where the bureaucratic machine is unfortunately covered in bubble wrap, completely disconnected from the reality of the nations and from the pulse of the people. Without constantly explaining the bene­fits of the EU and the possibility of fundings, the one-people-no-boundaries, people cannot be expected to grasp and embrace these concepts. Perhaps Brexit will make Brussels realise that photos of men in suits shaking hands won’t ever help people understand what the EU is. They need to put on their jeans and reach out to people in their homes. The need to go back to basics: Jean Monnet’s original idea for project Europe was to make sure that after World War II, dangerous populism would be contained. He reckoned without the media and, even worse, social media, and here we are now, 70 years later, with populism raising its ugly head again, simply swapping radio for social media as a propaganda tool and feeding the monster of fear and anger. And the EU must act now. It cannot keep living in its polite little bubble or Brexit will become Frexit, Spexit and Grexit. May I recommend that you watch Channel 4’s recently released Brexit: The Uncivil War movie. It is the drama of what goes on behind the scenes, revealing the people, strategies and feuds of the Leave and Remain campaigns. 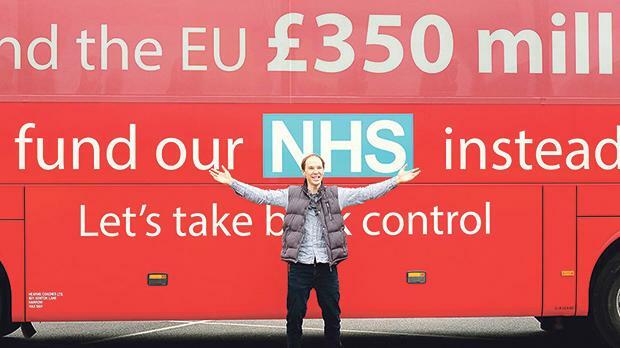 Significantly, it highlights the tactics employed by the Leave campaigners in their data-driven misinformation campaign. One movie critic said it feels like a post-mortem performed while the patient is still alive, and is just as painful.